Noelle is founder and director of Coordinated Movements. 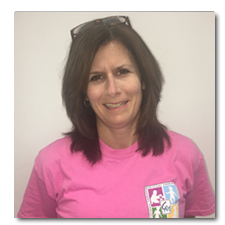 She is a Maryland licensed and nationally certified Occupational Therapist who has been practicing in Southern Maryland since 1993. She holds multiple certifications including: Sensory Integration and Praxis Test Certified by Sensory Integration International, Intermediate DIR/Floortime Therapist, Interactive Metronome Certified, Therapeutic Listening provider, and ILS provider. She attends numerous continuing education courses each year and has received additional training in Myofascial Release, Neurodevelopmental Treatment, vision, feeding, and Beckman’s Oral Motor Protocol. She is currently pursuing her Clinical Doctorate with a Pediatric Concentration at Misericordia University. Noelle has lectured throughout the Tri-county area on issues related to Occupational Therapy, Sensory Integration Dysfunction, and Problematic Feeding. Her special interests include vision, feeding, and sensory processing dysfunction. Noelle’s mission is to meet each child at their developmental level, identify their individual differences, and then provide them and their family the coaching support to help each child reach their maximum potential.